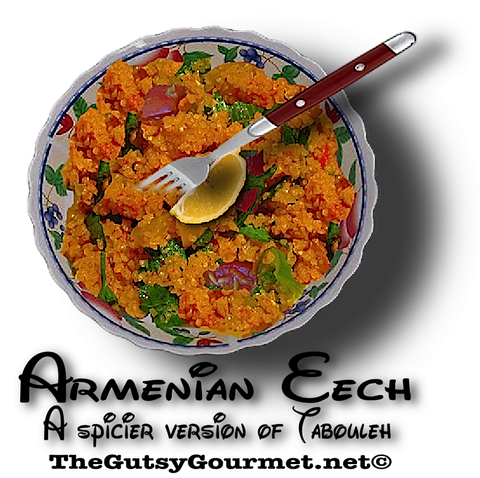 Middle Easterners, especially Armenians use a lot of bulgur in their diet. This dish is very similar to Tabouleh except that it has a few more spices added, especially Allepo peppers. 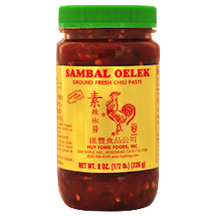 I like to use Sriracha or sambal oelek (**SEE COOKS NOTE**, oriental chili pastes in place of the Allepo peppers. and Pepper paste. Stir well to blend. 2. Add diced tomatoes, lemon juice and Pomegranate molasses, stir and bring to a simmer, stirring occasionally. 4. When completely cooled, add chopped parsley and green onions and stir. 5. Serve with Fresh grape leaves, romaine lettuce or iceberg lettuce. 1. You can eat this warm or you can refrigerate and let it get cold and eat. **If you don’t have hot pepper paste use Sriracha or Sambal Oelek chili paste found in the Asian food section of your supermarket.